Tuesday was my third and final HIMSS09, I had to catch an evening flight back home to be at work tomorrow. Realistically, three full days of crowds, vendors, and education sessions is pushing my limits, but I digress. On to day 3. The most interesting aspect of this session was not just the content presented, but the way the audience joined into the conversation. It seems there were representatives from at least 7 other states that were working on their own connectivity projects and Dan invited and encouraged some great collaboration with the folks in the room. The education session turned into a working session and while I was not particularly interested in the details/tacit knowledge being exchanged, it was fascinating to watch. Session: Who Should Really Be Flying the Project Management Plane? The session was presented by Dan Furlong and Mark Daniels from MUSC. While Dan’s former presentation was interesting, this session was one I circled right away when I first looked at the HIMSS09 agenda. I believe HIT alignment with clinical operations is the key to success. Dan and Mark seem to be completely in line with this type of thinking. MUSC has been through the typical IT adoption/integration model; a physician says it would be good if…, the IT department listens then sets out to build it, development and testing happen within IT, the project is completed, and the originating physician says, ” That’s not what I was talking about.” Recognizing the futility of this approach, MUSC set out to change their project management approach. First, they hired a physician CIO and promoted the position to the VP level. From there, they developed a governance process to encourage buy-in, support, and strategic alignment with clinical operations. Next, they developed a Project Management Office and formalized the project management process; focusing on checklists like those used in the airline industry. The result of this work is seamless alignment between IT and clinical operations. In fact, physicians are so heavily engaged in leading projects that MUSC experienced issues over the title “project manager.” In the end, they had to provide education to separate the role of physician leadership from the process management conducted by project managers. Like all implementations, there were bumps, but the model is working well for MUSC today. This session discussed the challenges of connecting disparate systems found as UPMC and was a nice overview of the process they used for integration. Like everyone else, data quality is an issue for utilization of data in the system. Seems to me that the data quality theme will be one of the major topics for HIMSS10. How will we address data quality? Does limiting those with input access to data solve the problem or is it oversight and integrity checking. Perhaps both approaches are needed. Automation can be an answer, but not everything can be automated and are still facing the daunting challenge of getting what is in the clinician’s head into the medical record for all to share. With that, I’m off to the bag check and on to O’Hare. Later tonight or tomorrow, I’ll post a overview of my experience at HIMSS09 including pictures and some video (I think). Thanks for reading and tweeting along. First, ROI. As a sign of the economic times and a maturing of the HIT industry, many are asking, “How is this making money?” or “How is this saving money?” The good news is, I’ve seen many examples of significant efforts that are doing both, saving time and making money. The Conifer Kiosk project I discussed in yesterday’s wrap up springs to mind. Their conservative estimates point to $5 million in real savings just in reducing printing costs. Interoperability. There is a growing sense of urgency in the realization that we are all working on HIT initiatives, but they all don’t talk to each other and the simply MUST speak the same language. I can send a text message to any cell phone carrier and it works. Why not healthcare? Connectivity. The primary role in a conference like HIMSS is to connect individuals who share common issues or can help each other find solutions. This year, HIMSS has an increased focus on social networking and the connections being made in that space have been outstanding. The best part of being here is the realization that we have a massive peer group. On to today. I have and evening flight back home today and will only be able to attend three sessions. On my list today is learning about MUSC’s effort in connecting rural hospitals with academic medical centers, finding the answer to the question, “Who should really be driving the project management bus?”, and then IT strategy re-engineered. I also hope to spend a little more time with the vendors. What are your thought through this point in the conference? Drop a comment here and share your reflections or expectations. Here’s to HIMSS09 day 3! Welcome the second full day of HIMSS09. After yesterday’s marathon sessions and opening reception, I was a little slower in getting out of bed this morning, but still made it in time to hear George Halvorson’s keynote address. Of course, it was a two coffee morning. I’m a physician in my 50s and my goal is to make it out of practice before being required to implement an EMR. EMRs cause 4-5 months of financial turmoil and they have not shown any ROI. I live in a small town and they know everything about me. My medical records are available behind the desk in my doctor’s office. If I needed my records, I could just go there and grab them. Liz Johnson, HIMSS Vice Chair started things off with a couple of administrative tasks and a quick overview of yesterday. She then discussed the financial report for HIMSS that basically closed before the economy went south. Operating revenue increased by 7% over the past fiscal year and HIMSS is financially sound and poised to lead HIT now and in the future. That was good to hear and judging by the attendance this year, next year’s report will likely be similar. The business model of care is based on maximizing the number of things that have fees. We have 18,000 billing codes for procedures and not one billing code for a cure. No billing codes for improved health. A Rand study found caregivers got care right only 50% of the time for adults and less than 50% for kids. How often doe diabetics get the right care? According to Rand, 8%. If we could move that to 80%, it would cut the number of kidney failures in this country in half. He sits on the board of the IOM and their goal is to see 90% of care based on scientific evidence by 2020. In what other industry would we set the bar so low? You’ve seen the commercials for new Alzheimer’s drugs and the warning to inform your physician if you are taking various medications before starting on their drug. How pathetically sad it is when we ask Alzheimer’s patients to inform their doctors of the drugs they are taking? Kaiser seems to be ahead of the curve in their HIT implementation and I would have liked to have another 30 minutes of his talk. I am planning to pick-up his new book, Health Care Will Not Reform Itself. The proceeds from his book are going to a medical charity in Oakland. This session featured Georgia Congressman and physician Phil Gingrey and former Wyoming Governor Jim Geringer. Both men have a history and strong interest in healthcare and after some opening statements, got down to some serious Q&A. In the end, both men were clearly on the side of fully integrated EMRs which brought another interesting question. Apparently, many supporters of a Michigan RIO have pulled out of the effort to develop their own EMRs and earn their slice of the stimulus package HIT pie. What can be done to address those who were working together and now are off on their own? Neither had a great answer to the question and sited the need for cooperation and interoperability, but missed the general point. Is the ARRA actually being somewhat counter-productive in regard to HIT? We will see. If I were doing this and it was within my power, I think the adoption of a fully integrated ERM would be goal number 1. Patients don ‘t wan t the government standing in the exam room between them and their provider. I’m not sure if that answered your question, but I’ve learn politically if you don’t like the question, answer another one. And that brought me to a big two hour, visit your favorite vendor break. I recognize why HIMSS wants this break, but I don’t particularity like it. The good news is, I had time to write the first half of this post and catch-up on some communication. Suggestion for next year’s HIMSS, more Recharging Stations! They have used this model to improve immunization rates, improve the quality of diabetes care, extend screening for led-related health issues, and many other issues. A side benefit to their system is the availability of quality metrics that can be leveraged on multiple improvement efforts and are used to benchmark physicians against their peers; blinded of course. My sense of their system is, it is relatively basic, but quite effective. You don’t have to have the most impressive system to improve clinical quality; you just need the data in a structured and meaningful way. The presentation was conducted by Jeff Nieman and Ron Kelley Conifer Revenue Cycle Solutions (an off-shoot of Tenet Healthcare). This session was one of those moments when your realize that there are people who “get it” out there. Conifer has produced kiosks for online bill payment and patient sign-in that are incredibly successful and producing real cost-savings while improving accuracy. The basic premise is, we want to have self-service and if it’s done right, it will make a big difference. “Self service is doing exactly what you done before in a self service way.” You don’t need to create a new process for self-service, just do what you do. Those are solid numbers and really point to what is going on in the world today. We want automation and self-service. Go to a supermarket, the airport, a Home Depot, they all have kiosks and everyone from kids to seniors are using them. They save time, save paper, and improve accuracy. Great quote, “If you are not online and paperless, you are missing a huge opportunity for cost savings.” Their ROI model is based on a cost of $.25 per printed page and with the reduction in paper of 80%, they are saving over $5 million annually. That’s a lot of green. Next up, the HIMSS09 Tweetup. Looking forward to meeting all the tweeps running around here. The first annual (I hope) HIMSS Tweetup was a smashing success. I enjoyed meeting as many of the HIT tweeple as I could and hope to stay in touch when we get back to the real world. Kudos to Cesar (@himss) for pulling this together! This is a very long post and if you didn’t make it to the end, I completely understand. If you did, please share your thoughts on the HIMSS09 conference. After a night’s sleep and a couple of cups of coffee, I’m thinking back to yesterday’s opening day of HIMSS09 and some themes have come to mind. First, due to the economic conditions, I expected to see a lot of empty chairs and downsized vendor booths at HIMSS this year and was delightfully surprised. I guess the billions of dollars for HIT in the economic recovery act are keeping the HIT industry moving forward. Regardless, HIMSS is a much better conference when there are jammed sessions. As for day 2, I expect to see a continuation of day 1. The George Halvorson keynote should be a highlight of the day and I’m also looking forward to the official Tweet up at 5:30 today. There is nothing better than actually meeting your virtual community fact-to-face. As much as we should embrace technology, we will always still need that personal interaction. 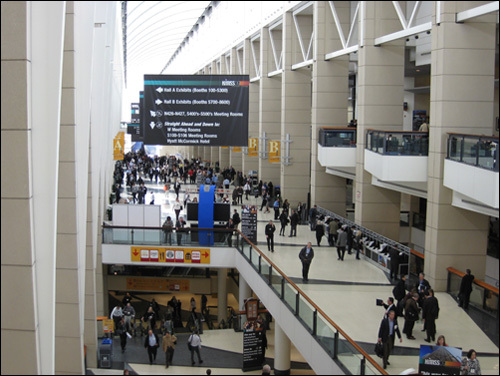 What are your thoughts about HIMSS09? The first full day of the HIMSS 2009 conference is now officially over and featured a number of highlights for me. Things got off to a rousing start right off the bat for me. Yesterday, I wrote a post about what I was hoping to see at this year’s HIMSS conference and as early as breakfast, I found someone who shares my vision for HIT. Dr. Douglas Winesett is a Pediatric GI specialist for the University Medical Group in Greenville, South Carolina and he was good enough to let me share his table at breakfast this morning. Dr. Winesett spends about half of his day seeing patients and the other half engaged in information systems to, “have a better understanding of what is happening in the IT world and be able to speak intelligently to our IT staff.” The challenges facing his organization are found throughout healthcare, but his approach was consistent with what I believe is the ultimate goal of HIT, to improve clinical operations and resulting in better outcomes. We discussed scenarios where a virtual office visit would be appropriate and the types of issues that would be outside of the virtual world. We talked about the sum of human knowledge and how it continues to grow exponentially; to a point where it is not realistic for anyone to keep up with the changes in the industry…even doctors. Here is an opportunity for HIT to fill the gap, give the physician the tools to make informed decisions by providing all relevant data including medical history, outcomes measures, and the latest research, all in real time. A great start to the morning. Next came my first session: MDs Who IM @ Work: Online Messaging Improves Physician-Patient Communication. Survivorship is the effort centered on returning a cancer patient into the community for ongoing care through the creation of a “passport” or documentation of treatment and care the patient received while under cancer treatment. The goal of the survivorship effort is to extend the continuity of care beyond a cancer center and provide for better patient outcomes. Moffitt has recognized the need for this effort and has a plan in place to build a patient portal to leverage their research and extend the reach of their cancer center into the community. One of the primary lessons learned through the planning and development is the need for quality control over the data that is being pulled into the system. As always, the output is only as good as the input. While I was in the second session, the conference had an official welcome ceremony that involved a number of athletic demonstrations from Chicago’s 2016 Olympic bid process. Here is a video from that event. This presentation came from Dr. William Jordan and Kim Hummel of the University of Alabama Health System. UAB was experiencing difficulties communicating with referring physicians and obtaining clinical information in a timely manner. The answer to their problems was to develop a physician portal that integrates with their EMR. The EMR development began in 1999 with transcribed documents and now includes encounter records, images, and orders. In 2007, a pilot was developed to provide web-based access to referring physicians of the EMR data. To access the system, physicians apply for access and the UAB Physician Services Department collaborates with Information Security to issue an RSA token to grant EMR access. To promote awareness of the system, UAB utilizes two physician liaisons to visit community doctors, they exhibit at various medical conferences, and encourage their physicians to write personal letters to community physicians inviting them to use the system. The pilot began in 2007 and they hope to have over 1,000 physicians registered by September. To determine the success of the system, they took a group of physicians who used the system and measured their total referrals in the fiscal year before they were in the system then the referrals sent after they started using the system. For the group, they found and increase of 157 patients after implementation. After a long stroll through the massive vendor exhibit area, it was time for Meet the Bloggers in the Tech Lab. I was invited to present at this round table session with some true innovators in the blogging community and felt privileged to offer my experience to the group. It was fantastic to meet the other bloggers in person and put a face to a Tweet. For more on the session, go to www.himssconference.org/techlab/. The day concluded with a conference reception, a long line at the shuttle bus, and some giant snowflakes on the way back to the hotel. The day was long, but well worth the effort. Here’s looking forward to tomorrow! I had a very cool experience this past weekend, I ordered a pizza online. I know it doesn’t sound like much, but Domino’s Pizza has a very slick interface that was both functional and entertaining. To begin, the ordering process involved a “build your own pizza” option complete with a picture of my pizza that changed as I added the first topping, split the pizza into halves, continued adding toppings until the pizza in the picture matched the one in my mind. Creating the pizza had an almost video game quality that was both functional and fun. Once the order was placed, I immediately saw a status window showing where my pizza was in the process. “Anna started building your pizza at 6:04 PM.” Add to that a nice graphical illustration of the steps remaining and a flashing status bar, and I could actually visualize where my pizza was in the process. “Anna put your pizza into the oven at 6:09 PM.” I found myself quite satisfied by the sense of access I had to the pizza creation process and the assurance that my order was placed. Finally, the most important step, the pizza arrived and when I opened the box, it matched the picture! A novel step I realize, but the best interface in the world does nothing if the product produced is suspect. Again, Domino’s got it right. They used a simple 5 star rating system on four key steps in the process and wanted to know how I felt about the entire pizza ordering process. The interface was slick and right there with the status bar where I could easily respond to the questions. When I finished my pizza, I realized why I liked the experience so much; this is how IT should work. Technology gave me unparalleled access into the pizza ordering process, allowed me to get exactly what I wanted and monitored my satisfaction with the product and service along the way. If it can be done with something like pizza, why not something more important like healthcare? Why can’t healthcare be like ordering a pizza? That got me thinking, what would the pizza process look like in a healthcare system? Let’s start with a search of the available physicians and services offered and select exactly what I need for my appointment. Maybe I could get recommendations as to the quality of the physicians or procedures from other patients and have direct access to research to help me decide the best solution for me. Maybe I could have access to someone within the system who could help me with my request; to make sure I make the correct selection for my issue. Of course, I would need integration from my insurance company to make sure the services I’m requesting would be covered. Once I make my selections, it would be nice to see a calendar of times for my appointment allowing me to schedule my visit around the kids baseball games, getting the carpet cleaned, and after the meeting on Tuesday. A good pizza is built with many toppings. For my appointment, the toppings can be the free flow of medical information from my other health providers, my insurance company, the current provider, and me. Things like family history, medications, allergies, and my own medical history need to come together to make sure I have the best possible outcome for any medical procedure. The extra cheese in this analogy would be making sure that I, as the patient, am as prepared as possible on the day of my appointment including knowing what to expect from the procedure and how long I will be at the office. When all the toppings combine, it could be a very tasty dish. On the day of the appointment, I should know what to expect then actually have my expectations met. Why should I have to wait for an exam room to come available? After all, you know I am coming, why I’m coming, and exactly what I want to have happen. I should expect to have things scheduled to maximize my time as well as the physician’s and his or her staff. Of course I would have to do my part as well, making sure I followed the appointment instructions, edited/completed any necessary patient information, and arrived on time to the office. In the end, my positive experience at my Dr. Domino’s would lead me to be an advocate for the office and rate them highly for others in my virtual communities. You would see me tweeting about the experience and sharing feedback with other potential patients. After all, one happy customer can have a big impact in today’s connected world. Is this a realistic scenario in today’s complex healthcare model? Patients are not exactly like pizza toppings; we don’t always come in the same flavors, shapes and sizes, but health IT should be better than it is today. The lesson of the Domino’s experience is learning from what is possible and adapting it to the healthcare industry. Can it be the same? Probably not, but it can certainly be much better than it is today. Claiming back some of the rewards given to doctors for improving productivity could save the government Medicare program up to $201 billion over the next 10 years, a congressional analysis showed on Thursday. Serious concerns exist about the efficiency of the health care system, but no simple solutions are available to reduce the level or control the growth of health care costs. Steps to restructure the insurance market and to encourage people to purchase less extensive coverage could reduce the use of treatments that provide minimal benefits, but enrollees would face higher cost sharing or tighter management of their care. Other approaches—such as the wider adoption of health information technology or greater use of preventive medical care—could improve people’s health but would probably generate either modest reductions in the overall costs of health care or increases in such spending within a 10-year budgetary window. That sounds like good news for HIT and for patient safety. The “serious concerns” statement should make us all sit-up and take notice. I beileve it is time for our indusitry to recognize the need for change on a broad scale and start to work on solutions from within the industry. While I’m optimistic about Federal reform, I’m just not 100% confident that more governement intervention is really in the best intrest of our industry in the long run.